Nicotine replacement therapies, which contain the nicotine cigarettes have but without all of the toxins of cigarette smoke; or, non-nicotine replacement therapies, products that contain medication other than nicotine. 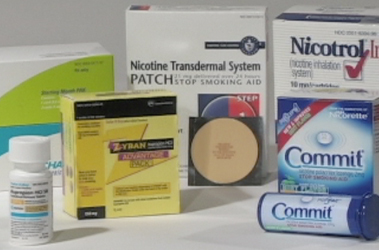 Some nicotine replacement aids, such as the patch, gum and lozenges, are available over-the-counter without a prescription. However, consult with your doctor before using them and follow the directions carefully. Don't smoke while using these products. They are to be used when you are not smoking. There is a risk to your health if you continue to smoke while using these products. "It wasn't an aid as much as a deterrent, because you know you are not supposed to have a cigarette with the nicotine patch." If you haven't been successful using these aids in the past you have other choices. Your doctor might prescribe a nicotine inhaler and/or nasal spray, or a non-nicotine replacement therapy. Depending on which aid you use, it either eases cigarette cravings and withdrawal symptoms, or blocks the stimulation of the pleasure center in your brain. Some aids mentioned can be taken in combination, under the guidance of a health professional. The dosages vary for each type of product and sometimes depend on your smoking history. Side effects can vary. You may need to try several aids before finding the one that works for you. "I would like to try the lozenges, because I don't mind the idea of that, because I always have a cough drop or a mint in my mouth anyway." Talk to your healthcare provider if you have any medical conditions, such as diabetes or heart disease, or are currently taking any other medication. They will help find the right stop smoking aid for you. Also, quitting aids by themselves are not as effective as using them in combination with changing your behaviors. There are many support resources available to help you when you're ready to quit. Take advantage of the written materials, Internet and phone support provided by many of the manufacturers of these products. If you're concerned about the cost of these products, don't let that prevent you from trying them. Most cost less over time than if you continue to smoke. Talk to your doctor or pharmacist. You may qualify for prescription assistance from drug manufacturers or other resources. What type of quitting smoking aid will help you out the most?